Various types of downy mildew fungi cause disease in a number of crops across North America. 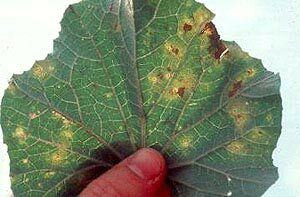 Irregular brown or yellow spots develop on the upper leaf surface; the lower leaf surface beneath these spots is covered with a hairy white or purple mold during humid weather. Severely infected leaves die. The fungus that attacks cucumbers and muskmelons (and less frequently squash and pumpkins) occurs mainly in the East. Fruits of infected plants are small and bitter. Cabbage family members are often infected as seedlings, which rapidly yellow and die. Mature plants may have sunken black spots on their heads. Moist weather encourages the spread of this fungus. Grow resistant varieties. Plant in well-drained soil on a site that receives excellent air circulation. Control weeds that can harbor the disease. Use treated seed or certified disease-free transplants. Till crop residues under soil to reduce spore production. Avoid wetting tops of plants when watering. Copper fungicides are effective as a preventive when applied as directed on the product label. It's best not to depend too heavily upon this method of control, as copper can build up in soil to levels toxic to earthworms and microbes. Organic gardeners can try aerated compost tea to prevent disease spread.